Just thought I would mention the problem I had last week with my car not running in case this ever happens to someone else. Symptom was engine cranked and fired up but then died. It didn't help in my case that I had just had the throttle body and MAF sensor off the car which lead me down several diagnostic paths ending in Red Herrings. In the end that was just coincidence. Fault codes were no use. I was getting some strange ones including faults about the AC system. Non of those were relevant in finding the fault it turned out. The only fault warning that ended up relevant was a "Low Oil Level" on the dash despite the oil level being fine. When I checked for fuel pressure at the Schrader valve on the fuel rail I couldn't get any. Then I noticed I couldn't hear the fuel pump running. This lead to another string of red herrings trying to find out why the fuel pump wasn't working. In the end it was of course something bloody simple. There is an earth strap that runs from the inner fender to the side of the engine block. It fixes to the block with a bolt. Also on the bolt is the ground from the engine oil level sensor. A bad connection at either end will stop the fuel pump from powering up. And of course can also throw up a low oil warning. In my case the bolt into the block was actually loose and half way out. 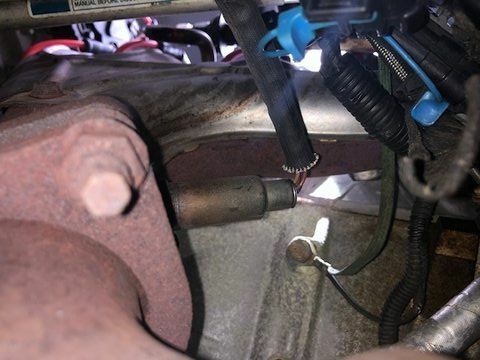 So the wires were just touching. Only took me a week to find it and that was with help from the guys on the US forum. But all the red herrings made isolating the fault tricky in my case. Same symptoms on my buddies '90 ZR1, sometimes it's the simple things that get you. Do you have any pictures of the offending connections? Firepit wrote (View Post):Do you have any pictures of the offending connections? The other end of the earth strap goes to a vertical stud on the inner wing just under the brake booster. The black wire is the ground connection for the oil level indicator. Cheers for that. Very handy if similar symptoms are encountered.